Athos garments are meant to fit snugly in order for the sensors to make good contact with the skin and relay accurate data. If you are right in between sizes, we encourage you to size down so the garments are most comfortable. This is to ensure that the garment doesn't fit too loosely which can prevent the sensors from making good contact and can lead to inaccurate data. Stick to the sizing chart if possible but remember, you do not want the fabric bunching, or moving off the body. If the garments feel too snug, there is a bit of a breaking in period (like with a new pair of shoes) so we suggest wearing the garment 1-2 times to allow it to stretch slightly. Once you get sweating a bit, the fabric should adapt to your body and is more comfortable once it gets moist. To take your measurements, start by wearing tight-fitting clothing or measuring over bare skin to ensure you're getting an accurate body measurement. Stand up straight and use a paper/fabric measuring tape to wrap around each part of the body. Chest: To measure the circumference of your chest, place one end of the tape at the fullest part of your bust/chest, wrap it around your body (under your armpits, around your shoulder blades, and back to the front), and note where the tape touches. 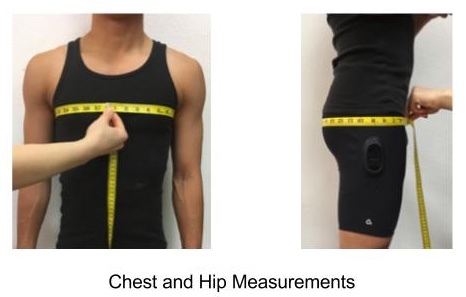 Hips: Start at one hip and wrap the tape measure around your rear, around the other hip, and back to where you started. Make sure the tape is over the largest part of your buttocks to get an accurate measurement. In general, if you're right on the edge of two different sizes, we encourage getting the smaller size to ensure that the garment is most comfortable and the sensors make good contact with your skin. Still have questions about sizing? Contact our Support Team and they'll be happy to help!